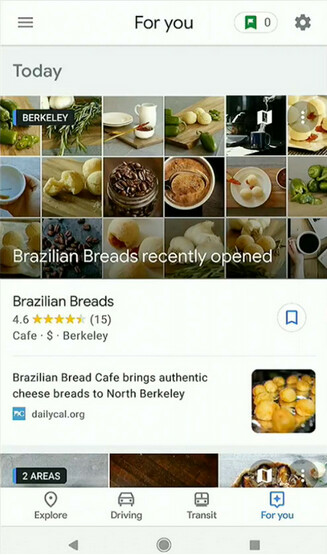 Google Maps to add new features including "For You" and "Your Match"
Google announced today at Google I/O that some new features are coming to Google Maps. "For You" is a service that provides Google Map users with custom recommendations for local places to eat, hang out and more. For those using Google Maps, it saves them the aggravation of having to open another app (like Yelp) to see similar information. Another new upcoming feature will rate a location based on the previous places a user entered into Maps, and give it a score out of 100. The higher the number, the more likely Google thinks that the person will enjoy visiting this destination. This is called "Your Match." It uses machine learning to produce the match score in combination with reviews on hundreds of millions of places left by human visitors. Users will also be able to long-press on a location to create a list that can be shared with others. For example, a Map user can create a list of his favorite restaurants and send it to a friend or family member who is visiting. Lastly, users will be able to talk to Google Maps while in navigation mode. You can ask the app to read new text messages, and even respond by saying "Share my ETA." Your estimated time of arrival will be taken right from your Maps screen and relayed to the person you are texting with. This will allow you to keep your eyes on the road ahead, even as you remain connected to friends, family members, business partners and customers. It should also lessen the urge to glance at your phone to check your text messages. These updates will be coming this summer for both Android and iOS users. Isn't there a light version of Google maps?? Google maps is so congested now with so much useless garbage on it. It's so slow. I don't use 90% of the features because i don't need them. Never had or heard of Google maps slow down. What device are you using?